The Garden of Allah Villas construction is finally complete and we now have the brand new shiny NBC Media Center. 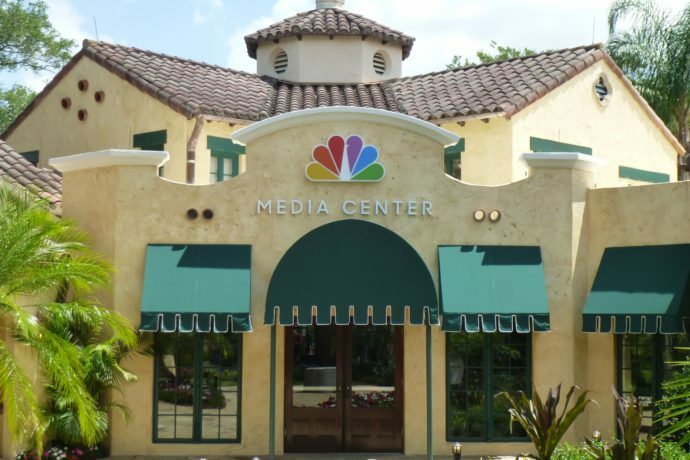 What’s the NBC Media Center you ask? Why it’s the new home for fall TV previews and focus groups of course! I just happened to be walking by today while they were looking for volunteers, so I was able to be one of the first people to experience the new Media Center. They’ve been doing TV previews in the parks for years, but this is a new, more high-tech approach. And having a neat storefront building helps convince people to volunteer, as opposed to taking folks to the back of a dark alley somewhere off the path. Check out my report and lots and lots of photos below! Inside you’ll find a big wall of monitors showing off all the different Television brands the company owns and runs. There is a reception desk and waiting area for filling out your paperwork. In the middle is a big room with over 50 computer stations, each with headphones and equipment to monitor you while you watch a program. And there’s also some conference rooms perfect for focus groups, and they even have their own restroom in here. In addition to fall TV show previews, they’ll be using this new innovative space for movie previews and other media focus groups throughout the whole year. For volunteering today I was offered $15 for my time, which is a nice way of saying thank you for taking time away from rides and attractions during your visit. They sat me down and started setting up. They strapped a thing to my wrist and three little sensors to fingers on my left hand. They’re for monitoring my heart rate and skin conductivity/moisture levels during the program. There’s also a video camera recording my face the entire time, and even a sensor that watches where my eyes are looking on the screen. It’s all pretty high-tech, and far more advanced then just a dial to turn right if you like something or left if you don’t. Plus, this way is more honest, especially considering it’s essentially a lie detector. After it was over I caught a glimpse of several line graphs on the screen, depicting my various life-signs from while I was watching. Pretty neat. Before the program started the computer showed me a few short videos of serene nature scenes and then roller coasters. I assume this was to get baselines of my stats for calm and excited. With the new set-up not only are they able to do more previews than before, but because it looks so nice and inviting they’ll probably have an easier time finding recruits. Sure it’s not a new Universal museum or small attraction like we were all hoping for, but it’s a nice looking building and at least it isn’t in any way an eyesore where it is. See all the images below, and be sure to check it out next time you’re at Universal! Approaching the area. Nice to finally see all the construction walls down! The area is beautifully landscaped. The view from inside. I couldn’t take more pics inside as it might’ve showed what was playing on the computers. Recruiters walking around out front looking for volunteers. A full view from the front. Unfortunately the gyroscope sculpture is missing, but the block remains. Closer view. Lets hope the gyroscope sculpture returns. A view of the new addition to the back of the structure. Team members can enter and exit through this back door with a path to backstage. The view from the corner heading towards Kids Zone. This side wasn’t touched during construction. The old entrance facing Kids Zone has completely been covered up now. A nice Garden of Allah themed bench. Street performers seen in the background. A neighborhood in the Hollywood Hills region of Los Angeles. The view from Kids Zone Pizza Co.
You’d never know this used to be two buildings. The back of the structure comes right up to the edge of the Pizza seating area. Back view of team member entry/exit with a path to backstage areas. Looks like it’s always been there. There were lots of characters in the parks today! Homer J. Simpson, nice to meet you! On the way out Mystery Inc. was on the case! That’s all for this update. See all of the construction updates here! And learn the history of Garden of Allah area, including what attractions these buildings used to house. Subscribe to the feed to keep up with park updates.